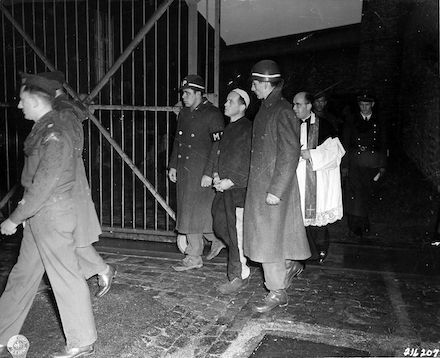 The U.S. Army hanged five German civilians as war criminals at Bruchsal Prison on this date in 1945. Their crime: lynching the crew of a downed American bomber, the day after Allied bombing raids devastated the manufacturing town of Rüsselsheim. The lynching is known as the Rüsselsheim Massacre, and it claimed the lives of six of the nine flyers of a B-24 Liberator cheekily christened Wham! Bam! Thank You, Ma’m!. One of their number survived thanks to his shrapnel wounds, which saw him safely to hospital while his comrades were being transported. “There are the terror flyers. Tear them to pieces! Beat them to death! They have destroyed our houses!” cried Margarete Witzler and Käthe Reinhardt. As the Americans protested, the crowd overpowered the guards and took its rough revenge with whatever bludgeons were ready to hand. At last, Joseph Hartgen, an air raid warden, finished them off with his pistol … or at least, finished off six before his chamber went empty. Spoiler alert: it will not go well for Herr Hartgen. Eleven Rüsselsheimers stood trial in Darmstadt for these Lynchmorde by July, when war was still raging in the Pacific: it was the very first war crimes proceeding under U.S. occupation. Harten and six others of the 11 caught death sentences, but the two women — Witzler and Reinhardt — both had their sentences reduced. Warning: Although not graphic, this is a video of actual hangings. * Quotes and figures from Working for the Enemy: Ford, General Motors, and Forced Labor in Germany During the Second World War, which is topical because Opel was a General Motors subsidiary. ** Brown lived long enough to return to Rüsselsheim at official invitation in 2001 for a formal apology. However, at the time of the trial, it was still mysterious how there came to be only six exhumed bodies from eight lynched airmen: Adams and Brown only emerged out of the mass of returning POWs after convictions had already been secured. † The army prosecutor at the proceeding was one Lt. Col. Leon Jaworski, but he’s better known for hunting larger game later in his career as the special prosecutor during the Watergate investigations. (Jaworski is the guy embattled President Richard Nixon appointed after firing Archibald Cox in the Saturday Night Massacre.) Jaworski’s eventual legal victory over the White House in United States v. Nixon obtained the incriminating Watergate tapes in late July of 1974, forcing Nixon’s resignation just days afterwards, on August 9, 1974.